3/11: Senators Grassley and Leahy have written another letter urging that the EB-5 regulation be finalized. 2/22: The EB-5 Immigrant Investor Program Modernization Regulation has progressed to the OMB review stage, the last stage before publication as a final rule. 2/15: H.J.Res 31 passed the House and Senate yesterday, and the President signed it today. Regional center program authorization to 9/30/2019 is on PDF page 463 (Division H, Title 1, Sec. 104). The EB-5 program can be changed through legislation, regulations, and policy. EB-5 was established by law as a permanent program in 1990, and the regional center branch of EB-5 has operated on a series of temporary authorizations since 1992. We depend on legislation to – at minimum — regularly reauthorize the regional center program. Legislation, regulations, and policy offer paths to program changes and reforms. In recent years, EB-5 has not been part of the conversation about immigration legislation. Washington D.C. has instead focused on two primary issues – border security and status of undocumented minors – and occasionally on these secondary issues: diversity visas, family reunification, work visas. Immigrant investment has had bi-partisan support but also bi-partisan disinterest, as it does not fit with either party’s immigration talking points. To the extent that EB-5 has been mentioned at all in Congress, it’s been in stand-alone legislative proposals specific to EB-5, or in connection with annual funding bills that have carried regional center program authorization as one of many provisions. Since 2015, Congress has given the regional center program many short-term reauthorizations as part of legislation extending government funding. All of these have been “clean” reauthorizations – with no changes besides changing the regional center program sunset date. However, major EB-5 legislation could possibly get included in a future spending bill. At minimum, we depend on Congress to include another regional center program authorization in the next funding bill or continuing resolution. Senator Grassley, Representative Goodlatte, and Senator Cornyn have been behind most EB-5 reform bills since 2016. However, Grassley and Goodlatte have expressed frustration with the legislative process and called on the administration to achieve reform by finalizing regulations. Negotiators who worked on the EB-5 Reform Act legislation circulated in March 2018 announced its death when the legislation was not included in the March 23, 2018 funding bill. Increasing EB-5 visa numbers through legislation requires (1) increasing total annual visa numbers, and/or (2) taking visa numbers away from another category and reallocating them to EB-5, and/or (3) redistributing visas within EB-5 by changing the per-country cap or adding set-asides. Recent legislative proposals have proposed reshuffling visa numbers, but so far not in a way that benefits EB-5. Process: EB-5 regulations originate in the Investor Program Office at USCIS, initiate a public notice and comment period upon publication in the Federal Register, get reviewed and approved (or not) for final action by the administration through the Office of Management and Budget, and finally become effective (usually 30-90 days after the final action date). There are currently two proposed EB-5 regulations, one dealing with investor/project-specific matters (including minimum investment amounts and targeted employment area designation), and other focused on regional center processes and administration. DHS published proposed EB-5 rules in the Federal Register in 2017, and expressed intent to advance them in 2018. 2018 deadlines were not met, however. Several prominent Congressional representatives who had worked on legislation covering the same issues have encouraged DHS to finalize the regulations instead. Policy translates the statute, regulations, and case law into policies to be followed by USCIS officers in the performance of their duties. Policy is not supposed to set new legal standards or impose new requirements, but simply to interpret and apply existing regulations and statute. USCIS has made several policy changes in recent years, including regarding tenant occupancy job counts, redeployment, and regional center amendment requests. 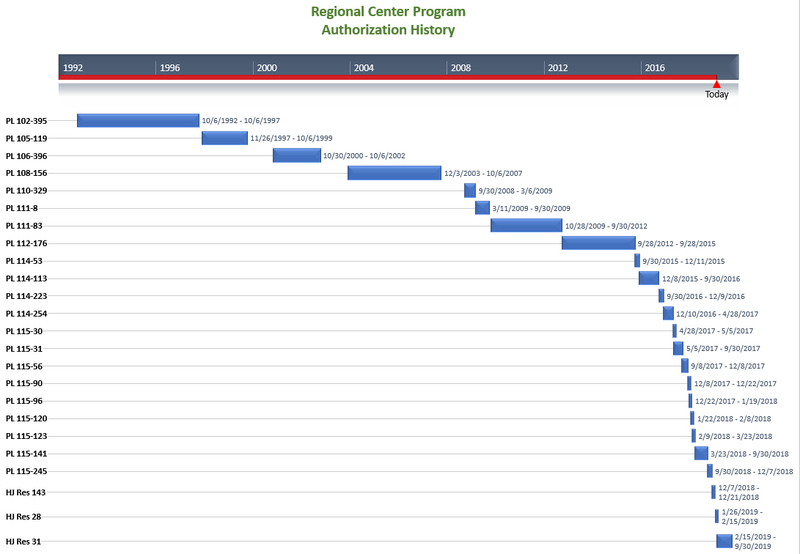 The last time Congress voted a significant regional center program extension was 2012. Since then, the program has been extended a few months at a time, in connection with government funding. The regional center program was most recently authorized to September 30, 2019 as part of H.J.Res 31, signed on February 15, 2019. The authorization language is in Division H, Title 1, Sec. 104 (PDF page 463) as follows: “Section 610(b) of the Departments of Commerce, Justice, and State, the Judiciary, and Related Agencies Appropriations Act, 1993 (8 U.S.C. 1153 note) shall be applied by substituting ‘September 30, 2019’ for ‘September 30, 2015. '” This language refers back to Departments of Commerce, Justice, and State, the Judiciary, and Related Agencies Appropriations Act, 1993 (Public Law 102-395) Section 610 (PDF page 47), which established the regional center program. The EB-5 regulation RIN: 1615-AC07 (with investment amount and TEA changes) is currently at Step 8 OMB Review in the Rulemaking Process, the last step before publication of a Final Rule. EB-5 Modernization Regulation RIN: 1615-AC07: Fall 2018 Unified Agenda suggests November 2018 for final rule. The rule would become effective at some point after it’s published, not immediately upon publication. Regional Center Program Regulation RIN 1615-AC11: Spring 2018 Unified Agenda suggests March 2019 for the “Notice of Proposed Rulemaking.” The NPRM would be followed by a period for public comment, and another period for DHS to respond to public comment before the final rule. 2/22/2019: The EB-5 Immigrant Investor Program Modernization has appeared on the OMB website in the DHS section of List of Regulatory Actions Currently Under Review. 11/1/2018: Speaking at the AILA/IIUSA Conference on October 29, IPO Chief Sarah Kendall did not provide any update on the EB-5 regulations, except to repeat that they would be finalized as soon as possible. 6/14/2018: According to letters posted in the USCIS FOIA reading room, Senator Rand Paul wrote a letter to USCIS asking that the regulations be withdrawn, considering excessively high investment amount increase, and that Congress should change the investment amount. USCIS responded that Congress had its chance, and that USCIS is considering public comment as it proceeds with the rulemaking process. 5/9: The Spring 2018 Unified Agenda is published with a new estimated Final Action date of 8/00/2018 for RIN: 1615-AC07. 5/8: IIUSA sends an open letter to USCIS in support of proposed rule-making. IIUSA encourages USCIS to finalize the proposed EB-5 regulation, but with lower investment amounts ($1 million, or $800,000 in a TEA) than previously suggested. 4/27: Speaking at the IIUSA conference, Kathy Nuebel Kovarik of the USCIS Office of Policy and Strategy reinforced her department’s position that they will try to get EB-5 regulatory reform done this year, as indicated on the Unified Regulatory Agenda. Here is a copy of her remarks. As you are likely aware, since last May there have been new rounds of Congressional negotiations on the future of the EB-5 Regional Center Program. We understand that during the course of these negotiations your Department was encouraged by both individual Members of Congress and stakeholders to not finalize the proposed regulations, since a potential legislative solution could be imminent. Recently, these good-faith negotiations collapsed due to the opposition of the same special interest groups who have worked to derail all efforts to reform the program. Because we do not foresee a legislative solution in the near term, we believe that it is incumbent upon you to end all delays and issue the proposed regulations in final form. The proposed regulations are firmly within your explicit statutory authority provided by Congress when we created the EB-5 program, and there can be no dispute that they address a number of serious deficiencies in the program. 3/1: I’m told that the regulations were not finalized in February to give Congress a chance to pass legislation, but may be back on the table in April since Congress didn’t act in March. Congress has periodically proposed reforms to the EB-5 program, or immigration legislation that could affect EB-5. H.R. 1044 ‘Fairness for High-Skilled Immigrants Act of 2019 and S.386 – A bill to amend the Immigration and Nationality Act. These could eliminate the per-country cap for EB visas. Border Security and Immigration Reform Act of 2018 (H.R. 6136) (aka the GOP comprise bill) was rejected by the House on June 27. It would’ve affected EB-5 by removing the per-country limit for EB-5 visas, which would decrease the visa wait time for backlogged China-born investors and while making wait times dramatically longer for everyone else. (I estimate that the wait time for conditional permanent residence would be a decade for all new investors, based on the number of pending petitions, were H.R. 6136 to pass.) H.R. 6136 proposes to increase visa numbers for every EB category except EB-5. Secure and Succeed Act of 2018 (Senators Grassley, Cornyn, Tillis, Perdue, Cotton, Lankford and Ernst) follows the Trump framework. It proposes reallocating diversity visas to reduce backlogs in EB-1, EB-2, and EB-3, but not EB-5. H.R. 4760 Securing America’s Future Act (Rep. Bob Goodlatte, with 92 co-sponsors) follows the Trump framework. It proposes reallocating diversity visas to reduce backlogs in EB-1, EB-2, and EB-3, but not EB-5. S.2344 – Immigration Innovation Act of 2018 (Senators Hatch, Flake) would free up employment-related visas in a way that would help EB-5 among other categories. But I doubt the it will gain any more traction this time than it did before, since it doesn’t fit in the administration’s immigration framework, and Hatch and co-sponsor Flake have already said their goodbyes to the Senate. The Hatch bill text does not, as misreported in some media, include RC program reauthorization or any direct reference to EB-5. 1. What happens if the regional center program is terminated? If Congress moves to terminate the RC program, one hopes that the move will come with new language that protects good-faith regional center applicants already in the system. (I estimate about 95,000 people, regional center investors and family, are currently in the pipeline between I-526 filing and I-829 filing.) Current policy treats regional center termination as a material change that would abort the process for people waiting on a green card, but does not address what would happen were the entire program terminated. Policy Manual 6 USCIS-PM G Chapter 4(C): Changes that are considered material that occur after the filing of an immigrant investor petition will result in the investor’s ineligibility if the investor has not obtained conditional permanent resident status. …Further, the termination of a regional center associated with a regional center immigrant investor’s Form I-526 petition constitutes a material change to the petition. Policy Manual 6 USCIS-PM G Chapter 5(C): Further, with respect to the impact of regional center termination, an immigrant investor’s conditional permanent resident status, if already obtained, is not automatically terminated if he or she has invested in a new commercial enterprise associated with a regional center that USCIS terminates. The conditional permanent resident investor will continue to have the opportunity to demonstrate compliance with EB-5 program requirements, including through reliance on indirect job creation. 2. What happens if regional center program authorization lapses as part of a government shutdown? The page for the Immigrant Investor Regional Center Program at USCIS.gov has been updated with the following information. The EB-5 Immigrant Investor Regional Center Program expired at the end of the day on Dec. 21, 2018, due to a lapse in congressional authorization to continue the program. All regional center applications and individual petitions are affected. USCIS will not accept new Forms I-924, Application for Regional Center Designation Under the Immigrant Investor Program, as of Dec. 21, 2018. Any pending Forms I-924 as of Dec. 21, 2018, will be put on hold until further notice. Regional centers should continue to submit Form I-924A, Annual Certification of Regional Center, for fiscal year 2018. We will continue to receive regional center-affiliated Forms I-526, Immigrant Petition by Alien Entrepreneur, and Forms I-485, Application to Register Permanent Residence or Adjust Status, after the close of business on Dec. 22, 2018. As of Dec. 22, 2018, we will put unadjudicated regional center-affiliated Forms I-526 and I-485 (whether filed before or after the expiration date) on hold for an undetermined length of time. All Forms I-829, Petition by Entrepreneur to Remove Conditions on Permanent Resident Status, filed before or after the expiration date, will not be affected by the expiration of the program. USCIS will provide further guidance to the public if legislation is enacted to reauthorize, extend, or amend the regional center program. 3. Would any EB-5 program changes retroactively affect people who have filed I-526? Some people in Congress have called for investment amount and TEA changes to be applied retroactively to past investors, but there isn’t any current legislation on the table to this effect, to my knowledge. Recent legislative proposals have suggested setting aside some visas as incentives for TEA investment. This could affect past applicants by reducing the visas available to them and making the backlog and visa wait time even longer. If legislation increased available EB-5 visa numbers, people already waiting for a visa would benefit. The priority date protection and I-829 process changes proposed by the regulations would affect people currently in the system. 4. Would proposed EB-5 changes affect direct EB-5? Changes to investment amounts and TEA definitions would equally affect direct EB-5 and regional center EB-5. The main difference is that direct EB-5 doesn’t depend on re-authorization, and integrity measures in proposed legislation have largely ignored direct EB-5. Benefit from this blog? Please consider supporting the effort behind it. As the EB-5 industry changes, your contribution can help preserve this space for conscientious and freely-available EB-5 reporting. Contributions go to Lucid Professional Writing (a for-profit business) to fund work on this blog. Thank you!